Aqua City Odaiba Shrine is a genuine Shinto shrine and the deity associated with it is said to grant seven wishes. 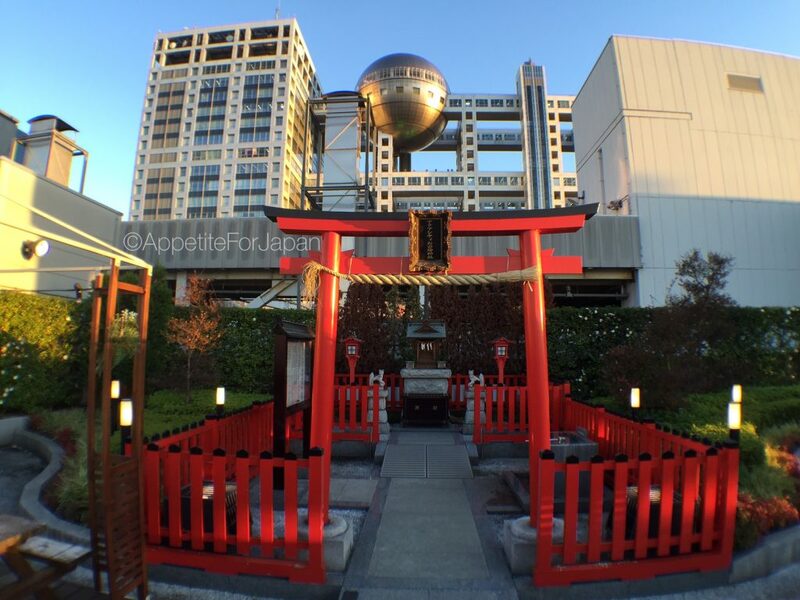 This is the only shrine in Odaiba, which is a man-made island in Tokyo Bay. A number of rituals are celebrated at Odaiba Shrine each year. The Fuji Television Building creates an interesting backdrop – you see quite a lot of contrasts between the traditional and modern in Japan, and this is a great example of it. There are plenty of tables and chairs on the rooftop for events, although when I visited, there was nobody else up there. 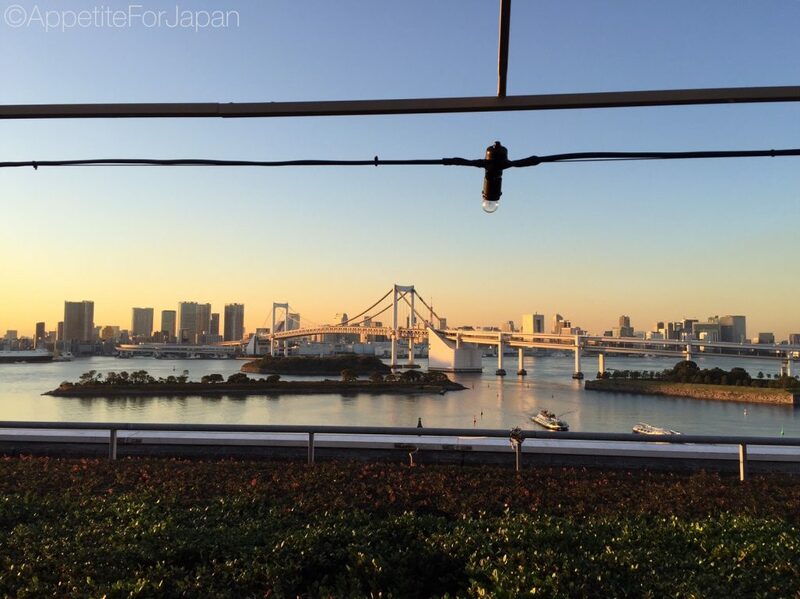 Whilst you can visit the Fuji TV building to view the Rainbow Bridge and Tokyo Bay for a fee, the views from the rooftop where the shrine is are fantastic and it won’t cost you anything to visit the shrine. We went up there just before sunset and the view was really pretty. I tend to think of Tokyo as a very ‘vertical’ city. Everything is built upwards because there are so many people and so many buildings to fit into such a small space. When you think of it this way, it almost makes sense that there would be a shrine on top of a shopping complex. And, believe it or not, rooftop shrines are not that uncommon in Japan. 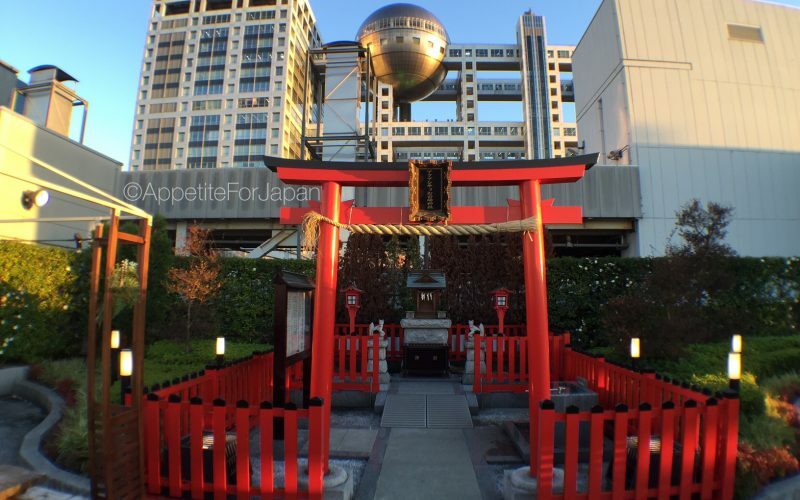 Would I recommend visiting Aqua City Odaiba Shrine? If you’re visiting the Aqua City shopping centre, then you may as well take a few minutes to see the shrine. 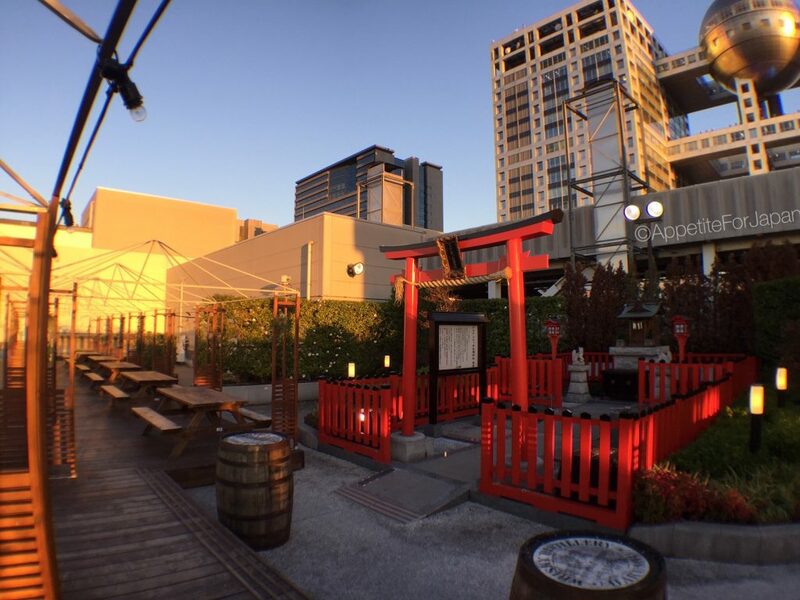 You’d probably only need to set aside 15-20 minutes to find your way to the rooftop and see the shrine (or maybe set aside a little more time if you want to enjoy the sunset up there as I did). Aqua City’s main shopping hours are 11:00 to 21:00, so I would assume that these hours apply to the shrine, although these could vary with events held on the rooftop. There are several ways to get to Aqua City in Odaiba, and these are outlined on the Aqua City website. My partner and I usually catch the train there and back (although there was that one time we stayed in the exclusive Gundam hotel suite which meant we could walk straight there). Since we generally stay in Shibuya, we catch the JR Yamonote line to Osaki station (just a few stops away) and then we change to the Rinkai line. 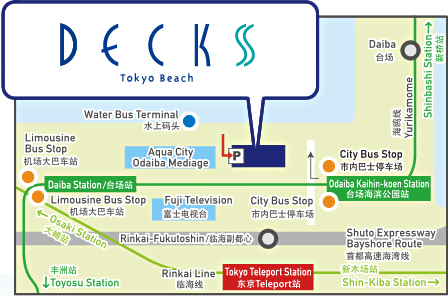 The closest station to the Aqua City shopping centre on that train line is Tokyo Teleport station. Next up we’ll explore the Venus Fort shopping complex on the other side of the island. It’s another interesting shopping mall, but for totally different reasons.